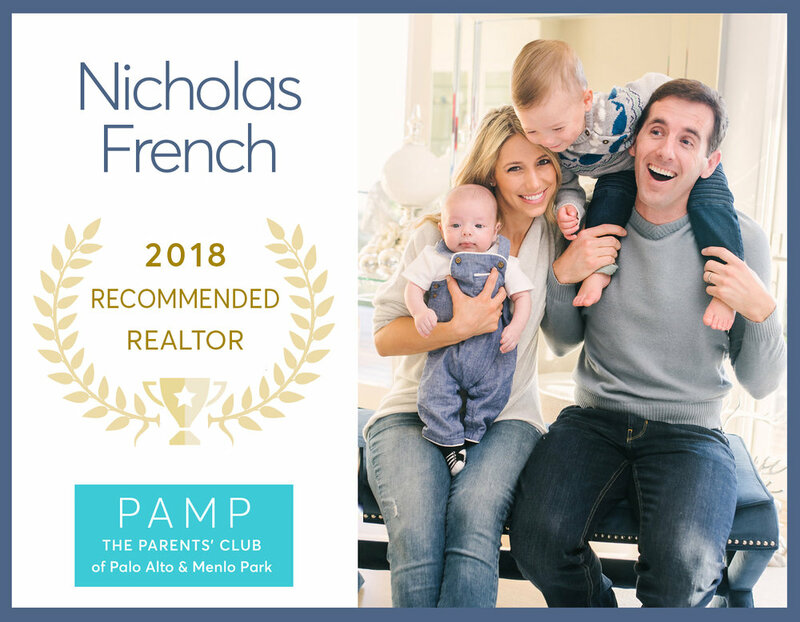 I bring a wealth of knowledge, experience, negotiation skills and professionalism to my practice and am well respected by my colleagues – important in the Bay Area market where multiple offers are the norm and agent-to-agent relationships matter. As a resident of the community and an avid runner and IRONMAN triathlete, this event is special to me—these are the trails and roads I train on every day. Join me at this fun community event. Use code NickFrench for $10 off your race entry fee. Together we’ll explore and learn about the different communities, schools, neighborhoods, market trends, and what area is best to target for your family’s needs. I'll take you on a customized tour through the Bay Area to help you understand all your options. I am honored to be recognized as one of the Top 10 Realtors under 40, out of thousands of realtors in our area by Gentry Magazine. I am honored to be among the very small handful of Silicon Valley realtors inducted into this elite group. Many of my clients have asked me what they should expect with the new the tax reform. The video below shares my 3 key take-aways and their impacts for people living in the Bay Area. Marriage is the biggest life changing and far reaching decision for an individual. Buying a home is the biggest life changing and far reaching decision for a family. One needs a trusted, experienced advisor in this arduous journey, especially in a dynamically changing white-hot market. 5 Stars for Nick! He has sold 2 houses for me. In this last transaction (February 2018), Nick was able to get multiple offers (7 total) and close on a selling price that was +20% above the asking price. That was big for my family and real $$$ in my pocket! 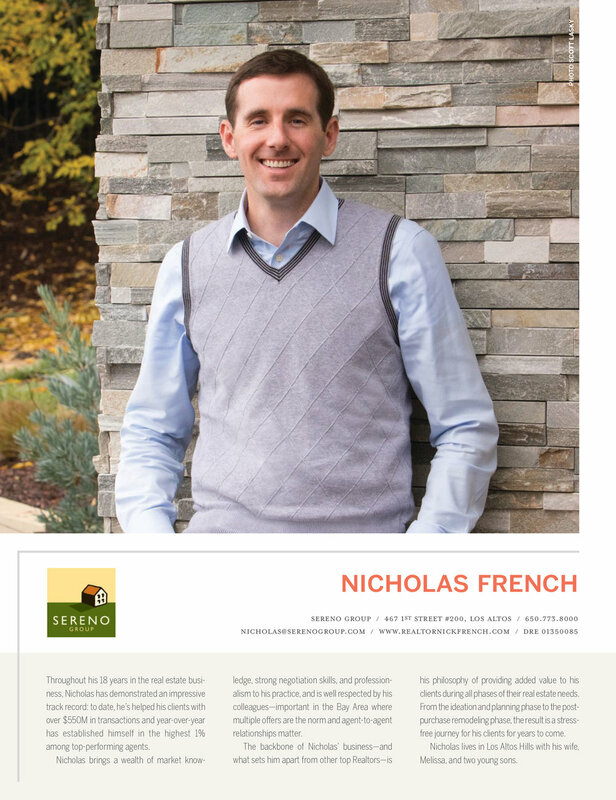 Nick French is a superman of a realtor! We have had the pleasure of working with him on both a purchase and sale of real estate. For our home purchase, he worked with us tirelessly for nearly a year to choose just the right home for us. Our experience with Nicholas French was superb! Nicholas is very dependable, professional and knowledgeable. His diligence and attention to detail is an asset to any home buyer. He knows his business and the area very well and was able to find us the home that we love. Nick is methodical, dedicated, and understood very quickly what we were looking for. Looking every weekend, Nick found that perfect house and walked us through every step of the purchase process. As a first time buyer, his advice and guiding hand were very comforting. Nick is a real estate broker you can trust! We were impressed with Nick right off the bat. He listened to us carefully, patiently showed us all of our options and helped us negotiate the best deal. Now we’re happily living in a home that’s perfect for our family! I never expected such a high quality of real estate service. Nick has provided great expertise, is very knowledgeable and is great at negotiating the terms of a purchase. We have built a good friendship that will definitely continue even after our purchase. Thank you so much for all of your hard work and dedication. Your knowledge, advice and support are invaluable and we are so lucky to have you helping us throughout this overwhelming process. Your patience, positive attitude and wonderful personality have helped us keep our stress and anxiety to a minimum. What we appreciate most is Nick’s relentless dedication and hard work, honesty, tenacity, efficiency, positive attitude, the ability to know our needs and thorough and intimate knowledge. He always went out of his way to accommodate our schedule. In the process, Nick has become a good friend to us and our kids. He is also our trusted adviser on things beyond real estate.